A modern Mac-style apple, developed at the Canadian Agriculture and Agri-Food research station in Kentville, Nova Scotia. Like several other apples developed here, it has the word "Nova" in its name. Novamac ripens a bit ahead of its parent, McIntosh, but inherits the classic Mac sweet wine-like flavor. We have been working with this variety for nearly 30 years. It has not gotten the attention it deserves. It can be picked over a long period an even when unripe is flavorful and crisp. At peak it rivals its parent 'McIntosh' for flavor, being somewhat more vinous. It bears well every year and has an easy form form pruning. 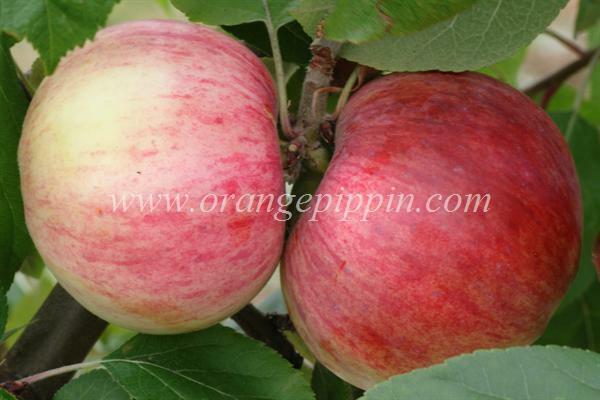 If we had to choose one apple to grow from all we grow (nearly 90 varieties) it would be 'Novamac'.